Indiana and Northwestern tussled back and forth all game long, neither ceding much ground. Try as they might, the Hoosiers just couldn’t break away. But when it mattered most in the game’s closing sequences, Indiana was able to muster up just enough stops and just enough scores to emerge victorious, 68-66. Rarely in this space do the referees come up, but Indiana was the victim of some seriously questionable calls on perimeter weave screens this afternoon, killing possessions before they could really get going. Indiana was also abysmal at the line — what’s new? — at one point missing four straight between Juwan Morgan and Robert Phinisee in the second half. Overall, the Hoosiers shot just 57.9 percent from the line (11-of-19). Now eight games into the season, Indiana is up in the 300s nationally for free throw shooting. You wonder if this is just going to be its reality for the remainder of the season. Indiana also faced an impressive effort from Dererk Pardon in this one. Northwestern’s senior went to work down low, hitting bucket after bucket, many of them left hooks, on his way to 24 points on 11-of-15 shooting. While the Hoosiers sized him up and keep bodies in front of him, he was simply just on another level this afternoon. Over its last four contests heading into this one, the Hoosiers have been rather reckless with the basketball, posting turnover percentages of 23.8 (at Arkansas), 24.5 (vs. UT Arlington), 23.3 (vs. UC Davis) and 25.4 (at Duke). There’s been some collective anxiety to their play, tentative passes, mental mistakes and flat out sloppiness. That changed some today. The Hoosiers’ turnover percentage landed at 19.1 for the contest, its third best mark of the season. Indiana was simply more decisive and better with the ball. Had they kept pace with their last four contests, it might have allowed the Wildcats to dip out of Bloomington with the W.
Zach McRoberts didn’t attempt a shot in 24 minutes of action and has felt a little invisible on the court over the last two games as he’s worked back into the lineup since his injury. But his ability to dive in front of ball and keep it from going out of bounds led to a Romeo Langford 3-pointer in the second half, a crucial play in a close game. Speaking of Langford, he re-asserted himself in this game after a rough performance in Durham. 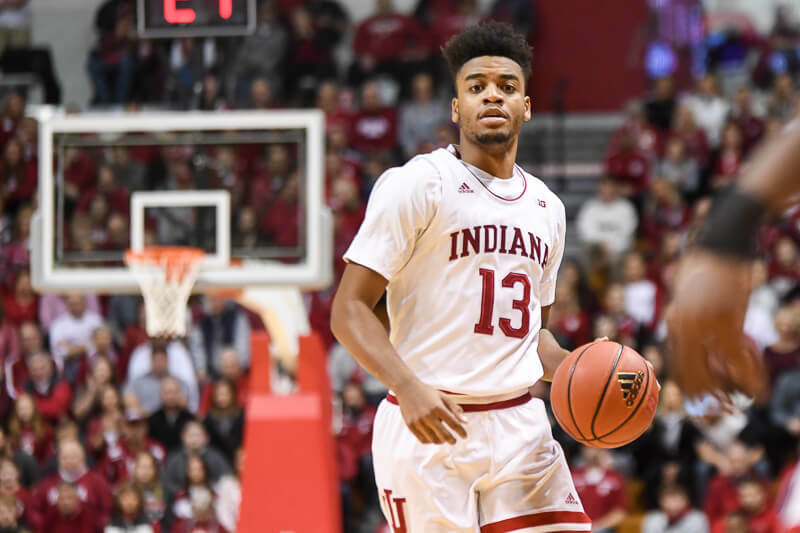 Langford was key down the stretch, hitting buckets to help the Hoosiers pull it out and adding a block on the defensive end to boot as Juwan Morgan sat with a lower leg injury. The New Albany product went 8-of-13 for 20 points, a team-high. Devonte Green got into the mix in this one, bringing his offensive creation skills to the table in the first half. Green had six points, two assists, a steal and no turnovers in 19 minutes of action. The Hoosier held Northwestern under a point per possession this afternoon, its seventh time in eight games its held an opponent under that mark. This was a little too close for comfort, especially after Vic Law hit that desperation 3-pointer, Phinisee hit 1-of-2 at the line and the Wildcats had a shot at the buzzer for the win. Still, it’s a conference victory, and those aren’t going to come easily this season.